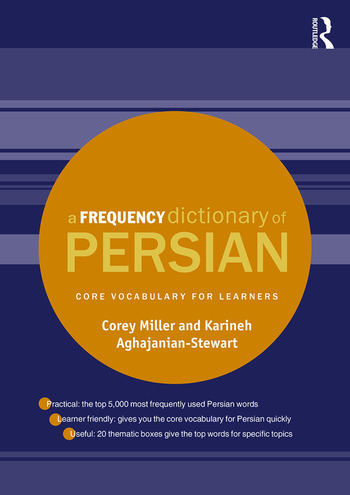 A Frequency Dictionary of Persian is an invaluable tool for all learners of Persian, providing a list of the 5,000 most frequently used words in the language. Based on a 150 million word corpus of written and spoken Persian texts from the Iranian world, the Dictionary provides the user with a detailed frequency-based list, plus alphabetical and part-of-speech indices. All entries feature the English equivalent, and an example of use in context. The Dictionary also features thematically-based lists of frequently used words on a variety of topics. Also featured are some grammatically-oriented lists, such as simple verbs and light verb constructions, and comparisons of different ways of expressing the months of the year. A Frequency Dictionary of Persian enables students of all levels to build on their study of Persian in an efficient and engaging way. Corey Miller is a Lead Computational Linguist at MITRE Corporation, Virginia, USA. Karineh Aghajanian-Stewart is a Senior Faculty Research Specialist at the Center for Advanced Study of Language, University of Maryland, USA.